With the MA Summer Show just around the corner, next up in our In The Studio interview series is Marta Terruzzi. Marta came to Chelsea with a theoretical background in visual arts and after a challenging start to the the MA Textile Design course, she really found herself and her practice through working with her peers and Chelsea staff, including our exceptional 3D workshop technicians. We love her innovative use of up-cycled textile fibreclay and advice to anyone thinking of studying at Chelsea at the end of the interview. I am originally from the North of Italy but I have spent the last four years in London. I arrived at Chelsea with a theoretical background in visual arts. At the beginning everything about the course was quite confusing to me. I wanted to focus on sustainability but I wasn’t really sure about what to do in my studio practice. With time and thanks to the incredible support of my course mates and tutors I found my way through the MA and now I can say I know what I would like to work on in the future. Over the last year I focused on up-cycled materials as a raw resource for designing and making new pieces. My practice is rooted in the fine arts, but with the artwork that I will present at the final show I aim to enter into a discussion about finding a potential commercial application for the processes I have developed and refined. I specialised in working with fibreclay, which is essentially a material made of textile fibres and a clay body. Please tell us about your work for the final show? 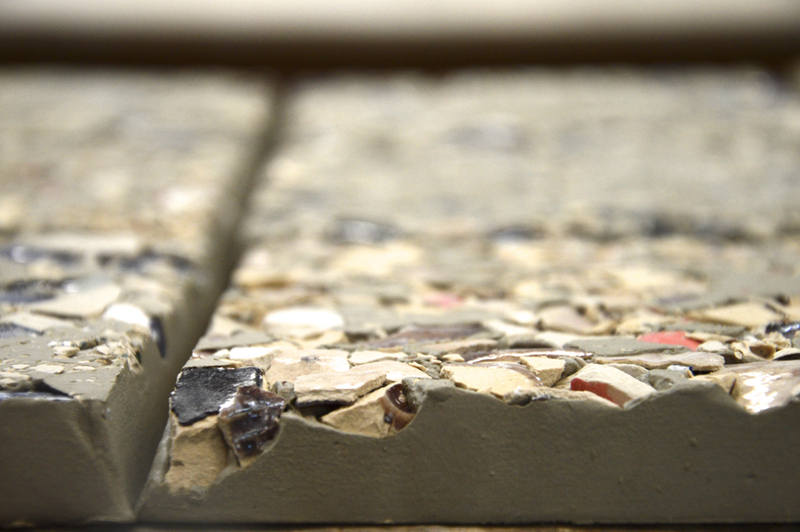 The piece that I will present at the final show will be an artwork composed of ceramic tiles made from fibreclay. Each piece of the composition is handmade and unique. 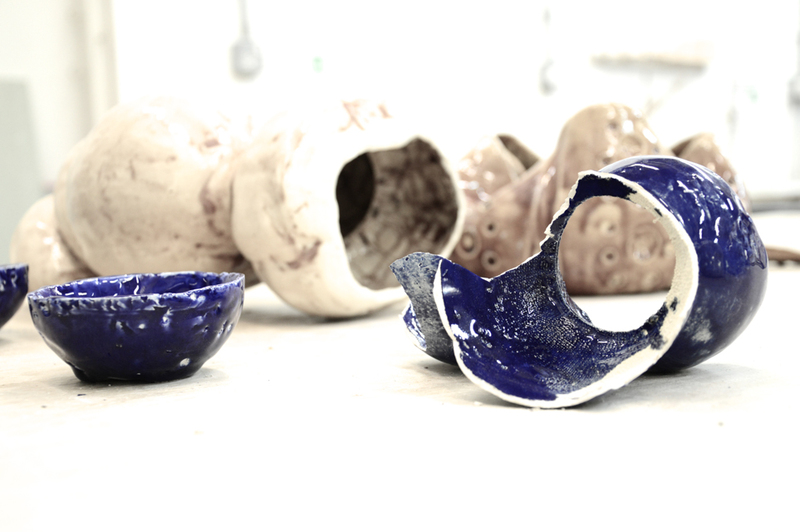 I came up with this idea as I was aiming to find a use for the ceramic test pieces that I made throughout the course. The final outcome will show the reintegration of that material into my practice. 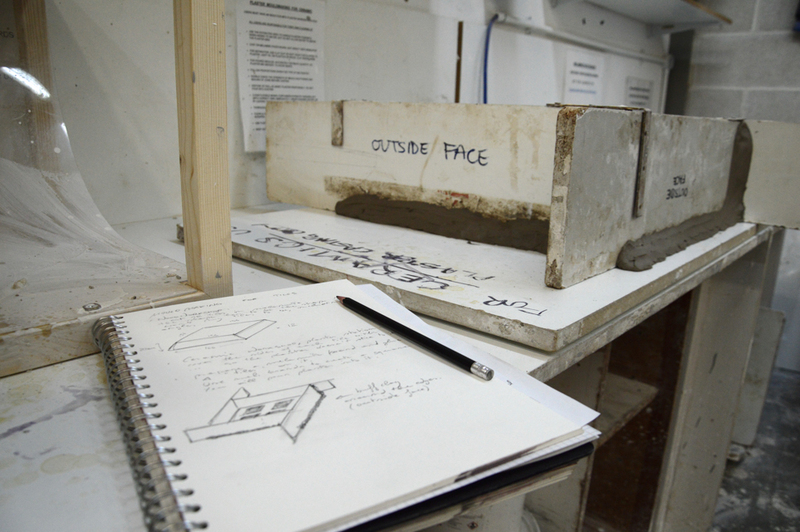 What was your greatest challenge in working towards the degree show? Apart from planning my time down to the minute, the greatest challenge is setting up a show that you know is going to be open to the public. You know people are going to see your work and perhaps criticise it. I have always been discreet about talking about my work; this year I have learned that there is nothing better than peer-to-peer discussions because these moments help you to grow as a person and as an artist. What do you see yourself doing after you graduate, what are your career ambitions? I aim to spend some time as an artist in residence in a gallery or workshop in order to develop my current practice in ceramics. At the same time I would love to travel, so an artist residency somewhere remote would be an appealing opportunity for me. I am very curious about living and working with people from different cultural backgrounds and very intrigued by finding myself in a new environment. What have you enjoyed most about studying at Chelsea? Spending time in the studio with my course mates has been a unique experience that I will always remember with a smile. Also, Chelsea College of Arts offered me great technical support while developing my projects. Technicians in the 3D workshops have always been helpful, incredibly knowledgeable and supportive. What have you most enjoyed about the area around Chelsea? Any tips? I loved being able to cycle to college from my house and around the area near Chelsea. Apart from being next to Tate Britain, the college is also very close to Saatchi Gallery. They always offer great contemporary art exhibitions there! What would you say to someone who is thinking about doing your course? Any advice? If you want to realise a project, here at Chelsea you will find the right support and like-minded students to share your interests with.